LADYVILLE, Belize District, Mon. Sept. 5, 2016–This morning, at a police press briefing at the Ladyville Police Station, Assistant Commissioner of Police Edward Broaster, who heads the Belize Rural Eastern Division, confirmed that a lab test done on a blood specimen taken from Dorian Pakeman, Director of the Government of Belize Press Office, who was involved in a traffic accident that resulted in one fatality, showed the presence of cocaine. ACP Broaster was responding to a question by Amandala about the police’s investigation of the fatal traffic accident that claimed the life of Gardenia mechanic Dean Dawson, 45. 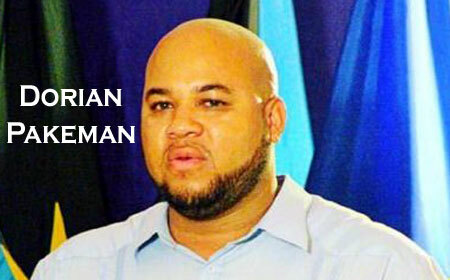 On the night of Thursday, March 31, there was a tragic accident on the Philip Goldson Highway between Miles 22 and 23, in Biscayne Village, when a government vehicle that was being driven by Pakeman, slammed into Gardenia mechanic Dean Dawson, 45, who was riding his bicycle and heading toward Crooked Tree. Dawson died upon impact. Pakeman, who was never charged, was only served with a notice of intended prosecution. ACP Broaster told Amandala that the police file had been sent to the office of the Director of Public Prosecutions since July 12, 2016. Pakeman was driving a Government Press Office Isuzu D-Max pickup truck which was extensively damaged due to the impact of the hit on Dawson. A long tire impression on the highway at the scene of the accident indicated that there was an attempt by the driver to stop the vehicle after the initial impact with Dawson, whose pair of slippers on the highway were far apart, one foot far from the other, about a lamppost length apart. At the time of the accident, Pakeman, who was heading toward his Ladyville home from Orange Walk, told police that he attempted to swerve out of Dawson’s way, but ended up hitting him anyhow.